Do you know the feeling when you get to the bar and can't decide what to order - a beer or a cocktail? Well... me neither, I usually know exactly what I want. But I needed an excuse to combine these two unlikely bedfellows, and I can't currently think of a better one. Beer geeks will scoff at you. Cocktail aficionados will turn their noses up at you. But here is a selection of beery cocktails, ranging from crass to classy (by my standards), adding some of my own twists along the way. 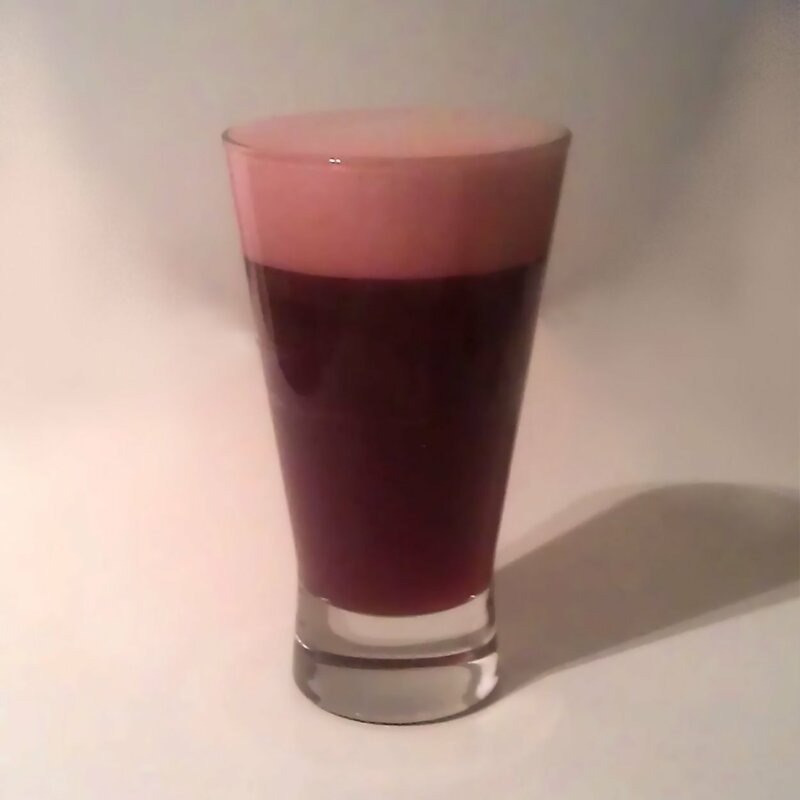 Snakebite and Black - a tasty combination of lager, cider and blackcurrant, which allows sixteen-year-olds to pour alcohol down their necks as quickly as possible. But you don't need me to show you how to make one. 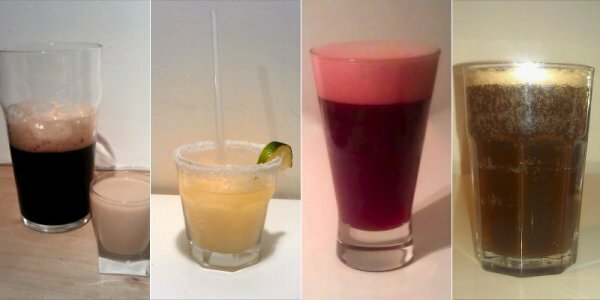 Michelada - mixture of beer, lime juice, tabasco and worcester sauce... tomato juice and tequila are also common ingredients. Popular in Mexico, this is one of the most common beer cocktails. Not included here because it sounds absolutely disgusting. Hangman's Blood - there are various recipes, but the most common seems to contain no less than five shots - whisky, brandy, gin, rum, and port - topped up with Guiness. I must admit I am curious to try this, but despite having all the ingredients at home, I just couldn't bring myself to do it. So onto the main event. To assist me with the tasting, I had the help of a special guest, FeedTheTang. 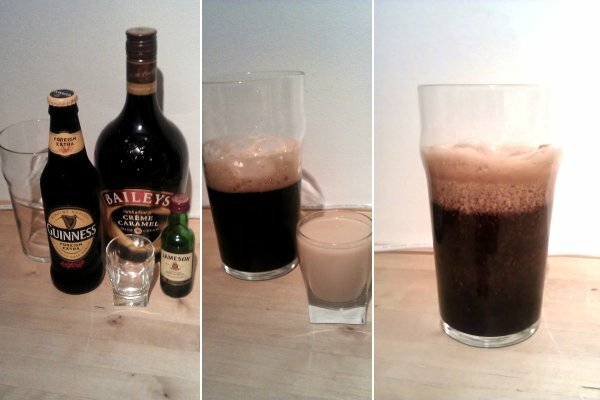 Fill a double shot glass with Baileys and Irish whiskey, and drop the whole thing into half a pint of Guinness (in a pint glass). I used Guinness Foreign Extra, just for fun. You have to drink it quickly before it curdles... in just a few seconds, solid lumps of brown crud start to form. Yum! Tang's Tasting Notes : "There's no way I'm drinking that. No way." 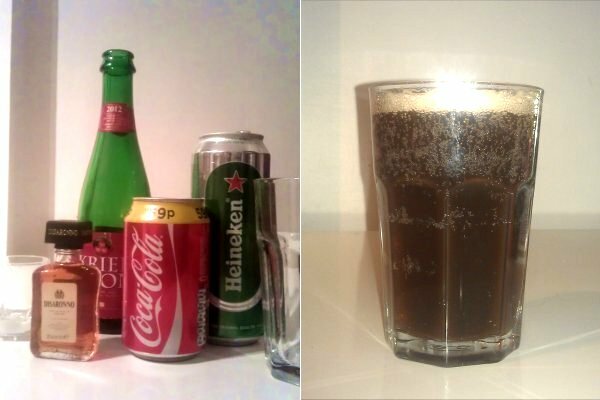 Simply put the amaretto and cherry beer into a glass, and top up with equal quantities of lager and coke. It really does taste a lot like Dr Pepper! Tang's Tasting Notes : "Very sweet. Tastes more like a fizzy drink than a cocktail." 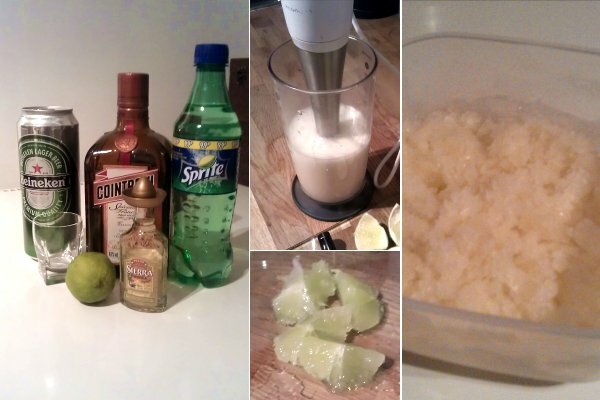 Blend the flesh of a lime with the other ingredients except the water. Put in freezer - the alchohol will not freeze solid, so you will be able to easily mash it up with a fork after it comes out. Add a little water, and shake it all up to make a slush. For that authentic touch of luxury, coat the rim of the glass with lime & salt. Serve with a lime wedge. 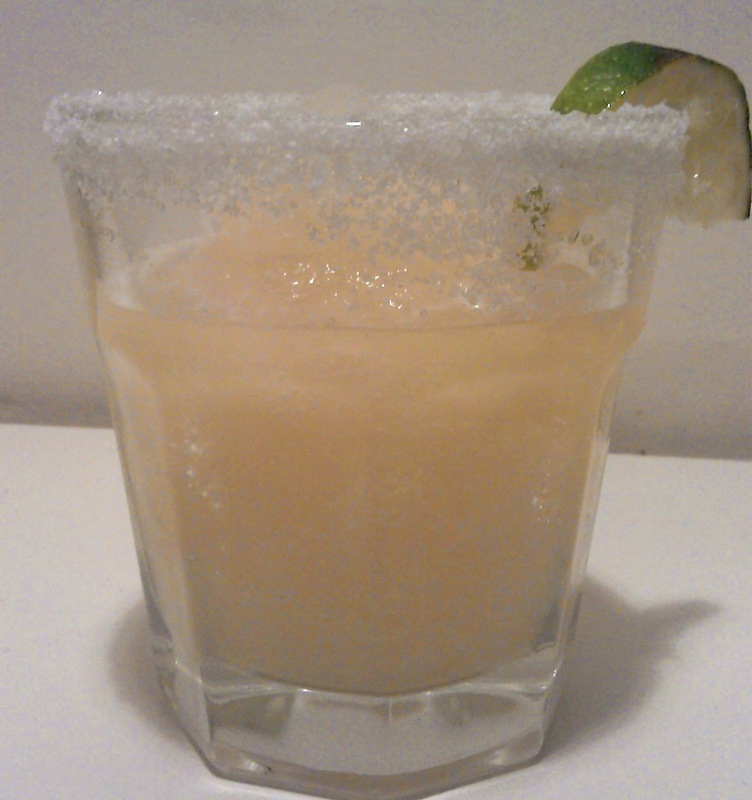 This recipe makes 2 small glasses of delicious margarita! Tang's Tasting Notes : "Very nice! Sour. Strong. Not too sweet." 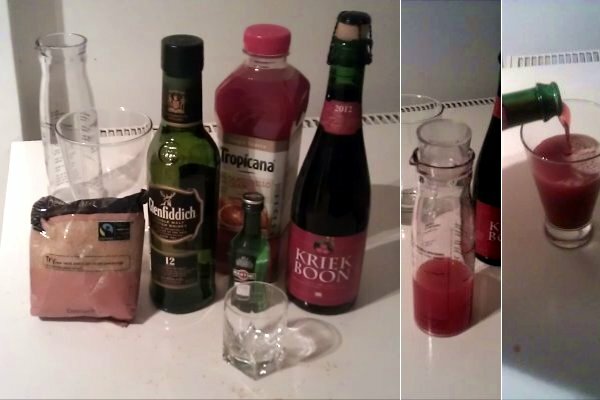 Shake the scotch, vermouth, sugar, and the blood orange juice, until the sugar is dissolved. I don't have a cocktail shaker, so I used a plastic bottle. Pour into a glass and top up with cherry beer. Tang's Tasting Notes : "Not bad. Actually quite nice. Tastes very alcoholic." So, the Margarita was the clear winner. Possibly the only drink here that transcended the novelty of the original premise, and something I know I'll be drinking again!